We are about 2 weeks away from Thanksgiving. What ? I still don’t know how in the world time just zoomed by and honestly, I’m still trying to catch up with lots of things. I gotta say though this month of November so far has been very forgiving in terms of weather. I haven’t had to pull out winter jacket and guess what…I still managed to wear my sandals. Yup..sandals and unpolished toe nails. No one can assure me what this winter will bring us. Tons of snow usually is almost the case, but as of now… I’m enjoying every day I could spend without having to dress up in 5 layers and puffy winter coats on top of that! The thought of Thanksgiving coming up excites the kids. They’ve learned about Thanksgiving at schools. We’ve read books about it. Turkey in disguise project was exhilirating for the 5 year-old. We just finished working on that and she couldn’t wait to show it to the class and tell her story. So….they are super ready for the occassion. Am I ready ? well, when food is involved, I always try to be ready 🙂 I love holiday seasons. Something festive and heart-warming about it. I know it can be stressful at times with many things going on around us and hosting a party at the same time. 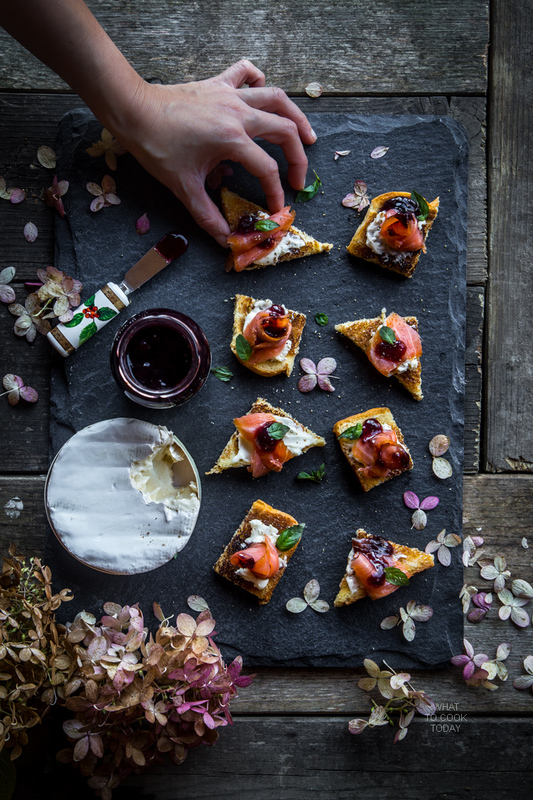 If you have some stale bread (which majority of us usually do), you can easily whip up this smoke salmon canapé for your easy holiday entertaining. Another variety that I like is Smucker’s Fruit & Honey Strawberry Jalapeno Fruit Spread. 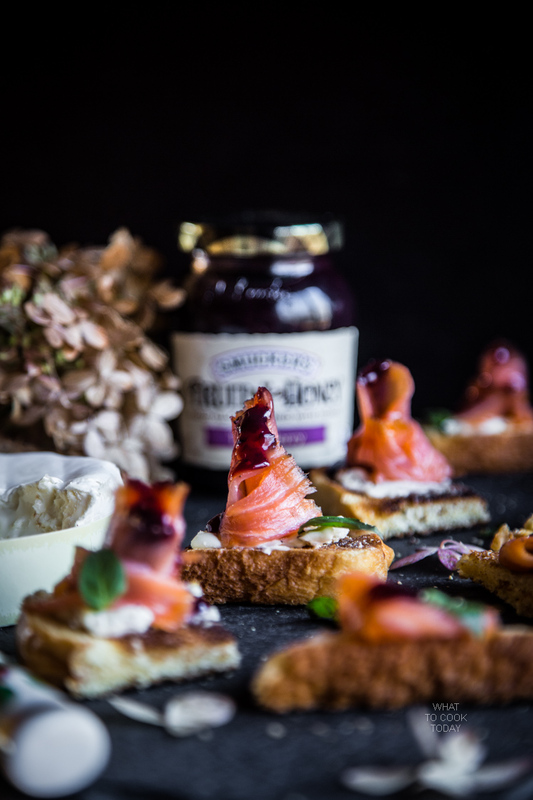 I had this spread before and it was so delicious that we’ve been purchasing it and use it for savory and sweet combination. 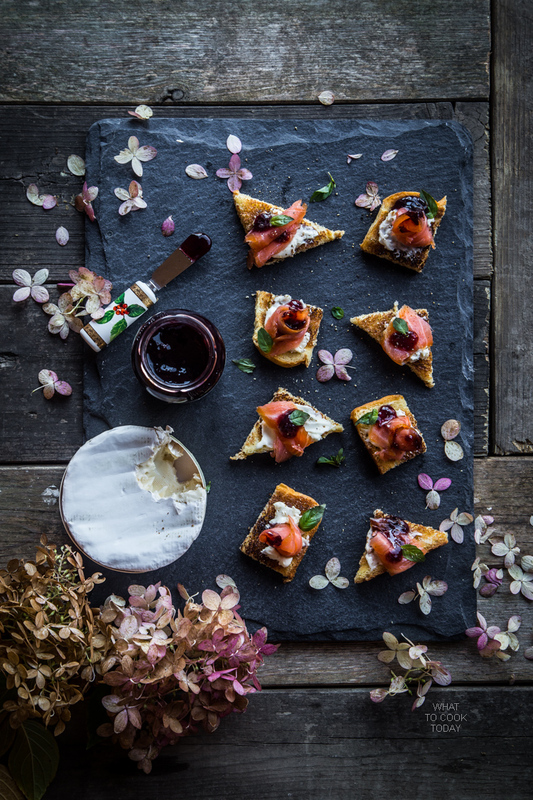 It will definitely work for this smoked salmon canapé as well, with hint of heat from the jalapeno. 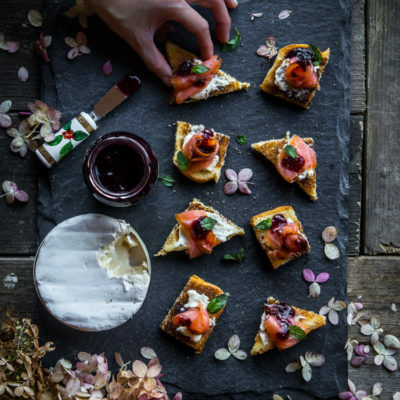 They are seriously great for easy holiday entertaining. They are visually appealing and couldn’t be easier to put together. My husband couldn’t stop bragging about the taste combinations (as I expected). 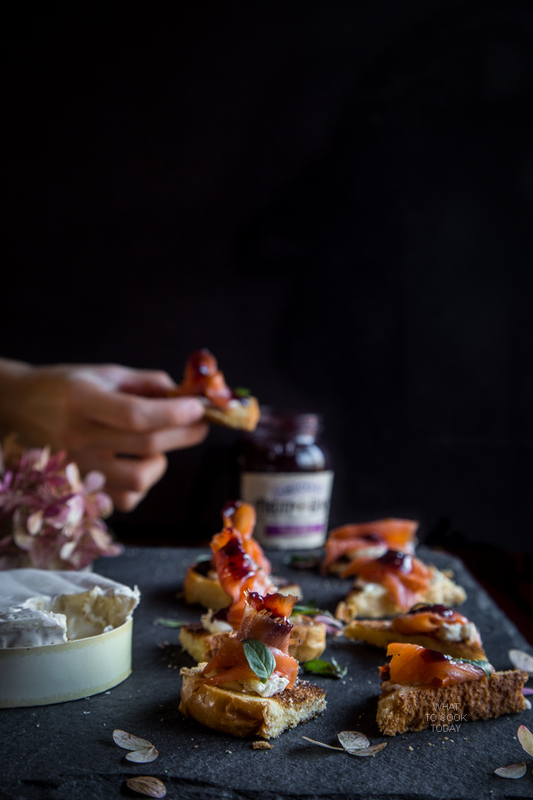 The smoky salmon, creamy and savory brie, and the sweetness from Smucker’s Fruit & Honey Triple Berry Fruit Spread (and you bite into some chunks of berries too!) are truly impressive. 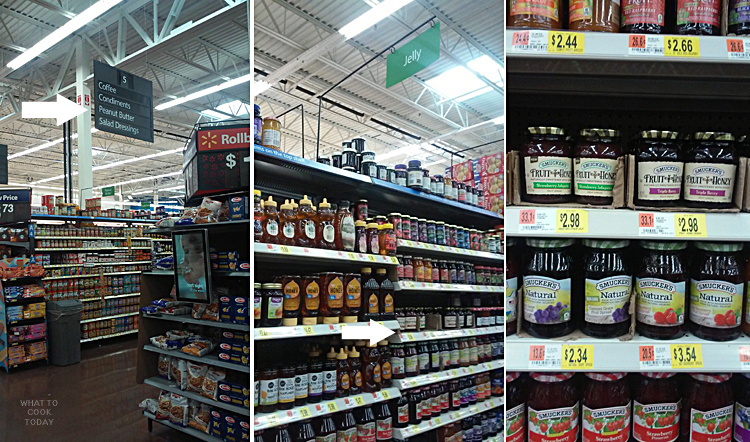 The next time you are at Walmart, stop by the Condiment aisle and check out Smucker’s Fruit & Honey varieties. There are also Smucker’s Fruit & Honey Strawberry Fruit Spread, Smucker’s Fruit & Honey Blueberry Lemon Fruit Spread, Smucker’s Fruit & Honey Concord Grape Fruit Spread. 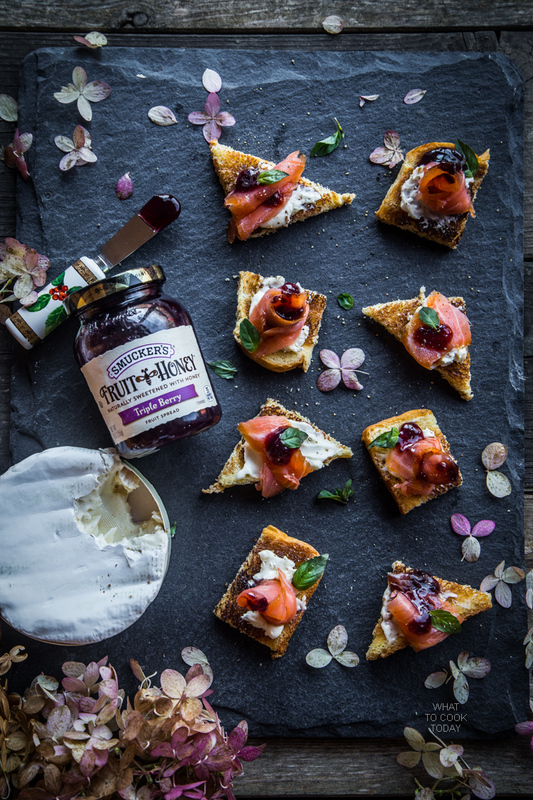 All the Smucker’s Fruit & Honey varieties are naturally sweetened with honey. You can also earn $1.00 off Smucker’s Fruit & Honey Fruit Spread. I can eat these smoke salmon canapé forever!!! Click this for more recipe and entertaining ideas. Thank you Samantha. We love this combo for sure ! !